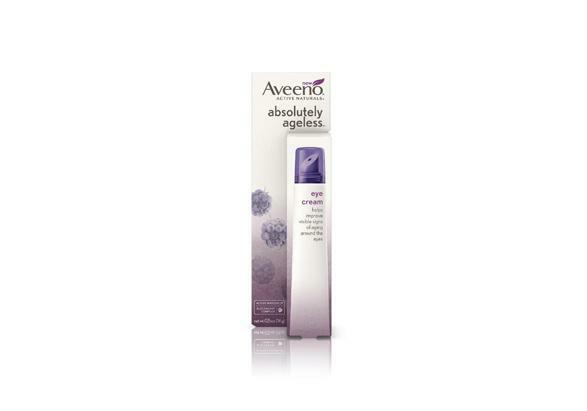 AVEENO® ABSOLUTELY AGELESS® EYE CREAM is rated 2.7 out of 5 by 16. Está clínicamente comprobado que esta crema para ojos nutre el área debajo de los ojos, es antiarrugas y combate la pérdida de elastina y colágeno, lo que ayuda a mejorar la apariencia de las persistentes patas de gallo, arrugas y finas líneas de expresión. También trata las ojeras y la hinchazón. Contiene antioxidantes y un exclusivo complejo de zarzamora. Verás que tu piel se ve más joven y saludable en apenas 1 semana. Agua, dimeticona, propilenglicol, glicerina, trisiloxano, copolímero de acriloildimetiltaurato de amonio/VP, polímero entrelazado de dimeticona, alquil benzoato C12-15, polímero entrelazado de metil metacrilato, octenil succinato alumínico de almidón, glucósido de ascorbilo, caprilil glicol, hexilresorcinol, nailon-12, poliacrilamida, goma xantana, isoparafina C13-14, acetato de tocoferilo, maltodextina, EDTA disódico, hidróxido de sodio, laurato-7, butilenglicol, extracto de peucedanum graveolens (eneldo), extracto de hoja de rubus fruticosus (zarzamora), mica, dióxido de titanio. Aplica una cantidad del tamaño de una perla debajo de los ojos en la mañana y en la noche, dando palmaditas suaves hasta que la piel absorba el producto. Rated 1 out of 5 by amysue from Allergic reaction Purchased this product and used it once. I didn't have a burning sensation although it was more akin to a 'warm' feeling. I woke up the next day to find my eyes swollen with a rash surrounding the lower part of my eye and continuing down into my cheeks. It took 3 days to go away, with a hydrocortisone cream from the dermatologist! Rated 2 out of 5 by Bellaaaaaa from Burning sensation I bought this product and ever since my first use i have been feeling a burning sensation under my eyes amd wherever i apply it. I stopped using it amd when i went back to using it the same thing happened every time. I was so excited about this product. Rated 1 out of 5 by Mary12 from Not worth the money I bought this because I wanted to reduce fine lines and puffiness under my eyes. It is a smooth cream that absorbs well into my skin, however after putting it on it causes my skin to burn for a few minutes. I tried it on several times and it always results in a burning skin sensation. I have not been noticing any changes to my under eye puffiness or fine lines and due to the skin irritation, I am not sure if it is causing more harm than good. Rated 2 out of 5 by Anonymous from Burning and red spots I have always liked aveeno products, but this eye cream in particular does not do well with my skin(fairly normal& occasionally dry). When I place it underneath my eyes, it starts to burn for a few seconds and red spots appear. At first I thought it was completely normal, but as I came to glance at what others were saying about this product I realized many have disliked it for that reason as well. I hope Aveeno comes up with a new formula for this eye cream. Rated 5 out of 5 by peanutsmom from Deminished Lines Around My Eyes I have had some bad health issues that I have been dealing with for the last four years and wasn't up to taking care of myself as I should. My health improved and I decided I had let myself go for to long. I went to a department store and decided to purchase the AVEENO ABSOLUTELY AGELESS EYE CREAM and honestly in a matter of a month and a half you could tell a great difference in the lines that use to be prominent around my eyes. I loved it so much I purchased a second tube before I even ran out of the first tube. Thank you Aveeno!!! Rated 2 out of 5 by Tab944 from Loved it at first I loved this at first, saw it working, felt confident. 2 weeks in, my right under eye has become red, dry and slightly scaley looking. Sigh. Stupid sensitive skin. I recommend to people with not so sensitive skin. Rated 1 out of 5 by Amy78 from Burned my skin I have been trying to get rid of dark circles and minor lines under my eyes. I used this product as directed, and it actually burned my skin. I now have extremely red, dry skin under my eyes that I am not sure how to fix. I actually can see the skin flaking off, and the lines are more prominent. Having used other Aveeno products in the past, I was extremely surprised and disappointed with the results of this product. Rated 5 out of 5 by Janet from Eye cream works After four days I was getting unsolicited comments that the bags under my eyes looked better. Very pleased so far. I use the eye cream and the serum sometimes twice a day but always at night. I wish this line Absolutely Ageless had a daily moisturizer without sunscreen. I don't need or want sunscreen just to walk around the house. Otherwise I'm crazy about this line. I had neglected my skin for the past 3-5 years and this gave me an immediate improvement. Wonderful!